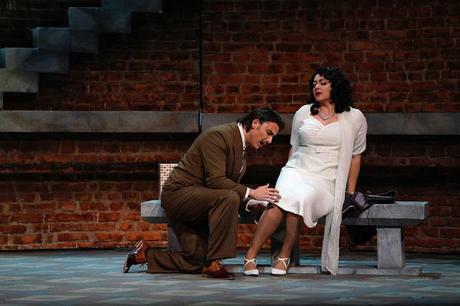 The New York City Opera resurrects L'Amore di Tre Re. Skirt thing: tenor Raffaele Abete engages in some unlikely fetishism in L'Amore di Tre Re. Photo © 2018 The New York City Opera. The New York City Opera exists now through a strange disguise, as a kind of hybrid company presenting a few shows each year at Lincoln Center's Rose Theater and a few others at smaller spaces around New York. This week featured the company's first production in decades of Italo Montemezzi's L'Amore di Tre Re, in a new staging by company general manager Michael Capasso. This opera is like a collision between every great love story: Tristan, Otello and Pelleas et Melisande packed into a lean ninety-minute score. L'Amore di Tre Re (the title means "The Love of Three Kings" is an anomaly, a 1913 opera written as a Romantic answer to th e then-dominant style of Italian verismo. After Arturo Toscanini saw it in 1914, the show swept like wildfire across North America, getting produced on all the major stages of this country. However, the Met dropped it from its repertory in 1949, and that was the beginning of the end. The show is now a curiosity, meriting only occasional revival. Nobody's really sure why it went away and only came back to New York stages once, in a City Opera production from 1982. Well, it's now 2018 and at Saturday's matinee, conductor Pacien Magazetti gave good reason for further performance. His young orchestra gave a supple and subtle account of this score, which feels like Debussy driven by the super-charged motor of the Italian operatic style. It is bold, sweeping music with grand gestures for brass and strings, and some impressive choral writing (well sung by an offstage group) in the church scene that ends the work. Its hot-house colors are redolent of Wagner and (more importantly) Strauss. As Archibaldo, the blind old king whose rage and jealousy lead him to strangle his daughter-in-law, baritone Philip Cokorinos sang with bold attack and the power of a large low brass instrument. His first aria was thrilling, establishing the presence of a bitter old man who turns finally to homicide. The only knock was that the Met veteran was somewhat unyielding of tone and unchanging in color: everything he sang sounded like it was carved from one granite block. It was powerful and impressive at first but became wearisome as the opera wound to its close. Tenor Raffaele Abete (who is alternating in this short run with another singer) proved a blithe young Avito, the young lover who seduces the princess. Handsome of demeanor and voice, he was tricked out in a natty period suit that was occasionally covered up by unbelievable and unconvincing disguises. (For some reason (probably budget) Mr. Capasso updated the setting from the Middle Ages to the 1940s, which made little sense.) Joo Won Kang sang the baritone part of Manfredo, the cuckolded husband and Archibaldo's son with conviction and real heartbreak. He also had a nice uniform. Mr. Abete had most of his scenes with Daria Masiero. The soprano played Fiora, the object of affection for all three kings. She has a big, ungainly voice, with a strong attack and uncertain tone when placed under pressure. Unfortunately the big Tristan-esque love duet required her to sing over an orchestra playing at full blast, with occasionally exciting but more often variable results. The projected titles, with lines evoking the skirt-hem and the "mossy" knees of the soprano in terms that would make E.L. James giggle, did not help matters. On to the the denouement! Archibaldo strangles Fiora, but, like Verdi's Otello, wants to know who betrayed him. So get this: he puts poison on her lips as she lies in state on her funeral bier, and waits for the first man to kiss her: that's her lover. In the short final act, all three men indulged in pressing their lips to Ms. Masiero's, who did her best to lie still for twenty minutes. Everybody died. So yeah. The libretto is silly, or at least horribly dated. The music's great. The singing was...variable. But in putting on this now-rare opera, Mr. Capasso and City Opera continue to fulfill the mission that they've set out to do.